September marked my 25th year as a Childbirth Educator. I vividly remember the first childbirth class that I taught – sitting in a church’s childcare classroom with 10 expectant couples. I was equally nervous and excited to teach. Many things have changed and many things have stayed the same over the past 25 years. I’m still excited today to teach each and every class. I considered it a ministry back when I first started teaching and I still think of teaching in the same way. One reason I was put on this planet was to prepare couples for the most incredible day in their life. September was significant for another reason. 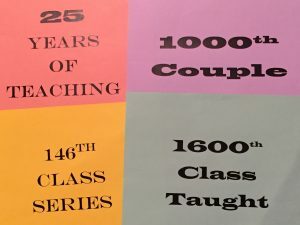 This September I reached the milestone of having had the pleasure of teaching over 1000 couples during these past 25 years! 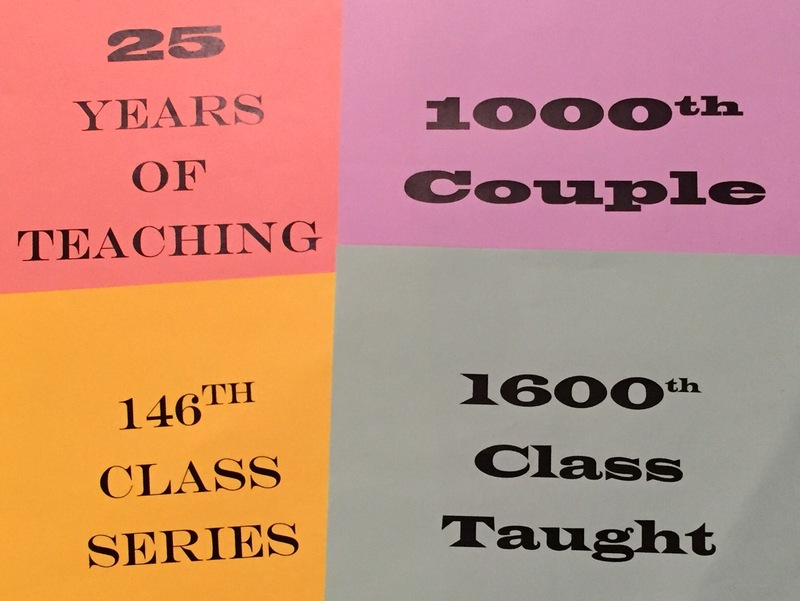 I started my 146th class series which included teaching my 1000th couple! I’ve taught about 1600 individual classes during this time — thoroughly enjoying each and every one of them. I have met some incredible people over the years and had the honor of being part of many births. I started providing labor support as a Birth Doula in 1997 which gave me the opportunity to be a part of almost 100 births. The experience humbled me as a human and definitely made me a better Childbirth Educator. My attitude and philosophy about birth and teaching childbirth changed the very first time that I provided labor support. Because of my Childbirth Educator training, my view about how birth “should be” was a bit rigid. I believed an unmedicated vaginal birth should be the goal of all of my couples. Before providing labor support, I felt that I had failed my class couples if they didn’t achieve an unmedicated birth. Through my experiences as a Birth Doula my rigid viewpoint was softened. My goal now is for all of my childbirth couples to have a positive birth experience and make the right decisions for their birth — be it unmedicated, medicated, vaginal, or cesarean. My Doula experiences helped to change my philosophy. I believe that I became more realistic, inclusive and accepting of everyone’s individual birth journey. The first couple that I provided labor support for had a long and difficult labor with lots of back labor. For many hours, the husband and I supported the birthing mother while she endured hours of intense labor because her baby was in the posterior position. I clearly remember thinking, “If I was this woman, I would have asked for the epidural hours ago.” Amazed at her strength, awesomeness and how she powered through before accepting the pain relief of the epidural, I am forever grateful for the privilege of this first Doula client and the many others that came later. The births that I attended expanded my personal experiences to prove each labor and birth is unique with no right or wrong way to have a baby. As long as a woman (and partner) is educated and supported, she will have a positive birth experience and feel good about her birth, her abilities, her choices and her baby. One of the joys of teaching childbirth is meeting and getting to know so many wonderful people as they sit in my living room on a weekly basis. I’ve met many teachers, lawyers, doctors, physical therapists, nutritionists, waiters, bakers, accountants, homemakers, artists and the list goes on and on. I learn from them every week as they learn from me. Asking such interesting questions and sharing experiences, they always push me to be a better teacher. I will always cherish that I get the honor of being a part of their lives during this special and life-changing time! The emails, texts and newborn pictures are a delight that never gets old and always make my day. Another perk of my job is working alongside the wonderful birth professionals in San Antonio. Beginning with the childbirth teacher that taught me when I was first pregnant to all the other fellow childbirth instructors I’ve worked with and learned from over the years. Many of them are dear friends that I will cherish forever. I’ve also been blessed to work with the many wonderful doctors, midwives and nurses in San Antonio. I’ve witnessed the powerful impact their nurturing care has made to the new moms and new families. These are care providers that understand and embrace the fact that birth is not limited to a physical and medical event but an emotional one that needs to be treated with the utmost respect. It’s been a wonderful 25 years of educating families! I plan on continuing to teach for many more years to come. I hope to one day teach my 2000th couple, maybe in the next 10 or 15 years. I know I’ll enjoy teaching them as much as I’ve enjoyed the students before them. I am a blessed and lucky woman to do what I do. 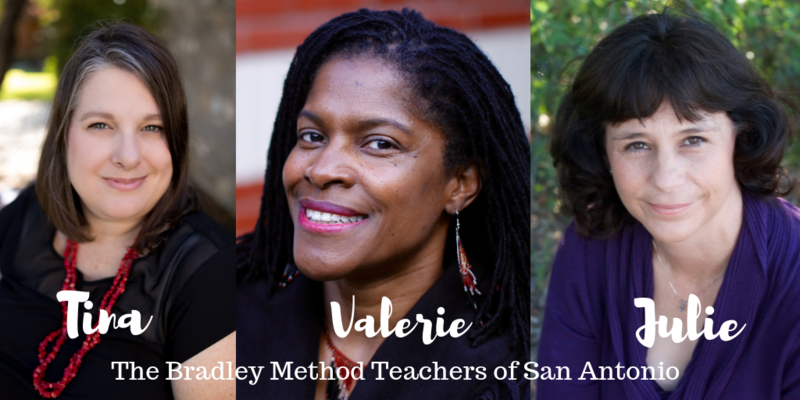 This entry was posted in Uncategorized and tagged Birth, Childbirth Education, Doula, Families, San Antonio. Bookmark the permalink.